Do you have a tired site in need of a redesign or need a new website? Please contact me to discuss the particulars of your project. State of Hawaii alliance of professional potted and cut flower orchid growers in the state of Hawaii. Logo and web site redesign. New features added to the site include a random rotation of the growers to feature a different grower on each page load and improve member visibility. 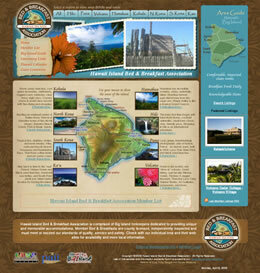 Volcano, HI community association informational site redesign. New site includes a content managment system to allow admins to update the information. Kailua Kona, HI Real Estate Services. Featutes MLS data using my custom akamaiDX parser. Honolulu, HI Venous Clinic for treatment of venous disease. Static brochure style site. Albuquerque, NM Jewelry Designer and Wholesale catalog. Ecommerce site built on ZenCart. Call for artists to participate in the Albuquerque International Balloon Fiesta Arts & Crafts Show. Informational brochure and display site. Kurtistown, HI Glass Artist portfolio. Static information pages plus ZenPhoto photo gallery. A kamaaina knows and appreciates Hawaii's unique local character, if you need a professional website that reflects our island home contact me today. 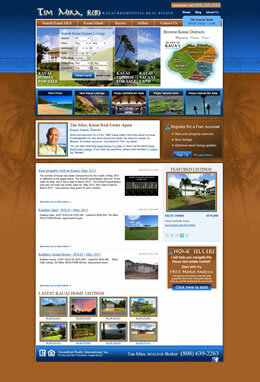 While I live and work on the Big Island of Hawaii I provide graphic and website design services world-wide. If my style fits your needs please let me know about your project! 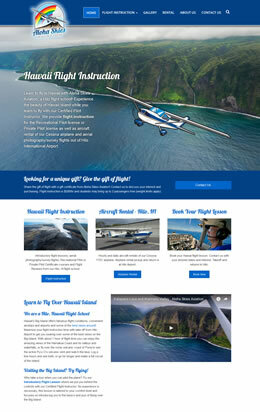 Informational site for Aloha Skies Aviation, a flight school based in Hilo, Hawaii. Also provided logo design and photography services. 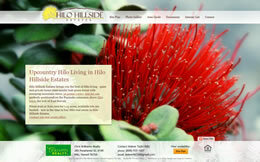 Informational site for the Hilo Hillside Estates subdivision in South Hilo. Site features slideshows, an interactive map of the available properties and a contact form. 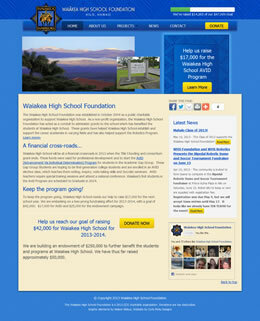 Informational site for the Waiakea High School Foundation. Equipped with a CMS Made Simple site editors can easily post news and update the donation progress. Kauai real estate MLS search built on the OpenRealty platform, features live data from HIS via RETS feed. 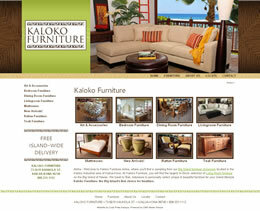 Brochure site for Kaloko Furniture, Kailua-Kona furniture. Features a database of sample products arranged by category. 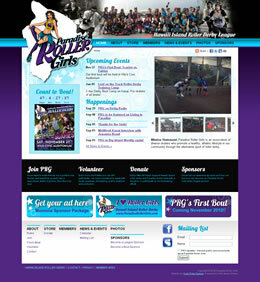 League website for the Paradise Roller Girls, Hawaii Island Women's Flat Track Roller Derby League. Logo design and website. Site features user accounts, dynamic photo galleries, calendaring and mailing list management. Logo design and website for Coastal Moonwalks of Jacksonville Florida bounce house rentals. Website features online catalog and reservation request system. 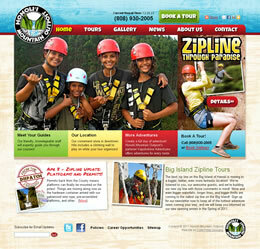 Brochure site for zipline adventures by Honoli‘i Mountain Outpost. Features tour information and booking. Real estate website redesign to unify Windermere Properties and C and H Properties' 3 domains into a single identity. Hawaii real estate listings and Hawaii MLS search. 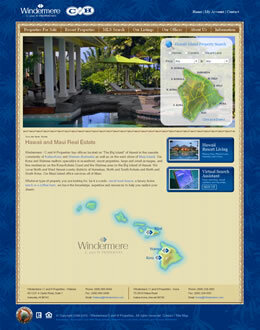 Site built on a content management system with AkamaiDX to connect to Hawaii Information Services MLS feed. Informational site for the MKVIS. Features galleries, calendars and lots of information for visitors. 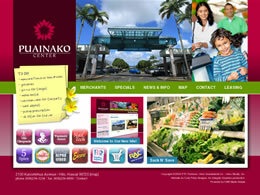 Website redesign for Puainako Center in Hilo, Hawaii. Includes merchant directory, coupons and specials section and leasing info. 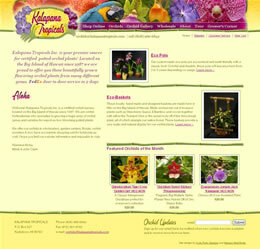 Logo design and website design and production for Kalapana Tropicals, Hawaii orchid grower. 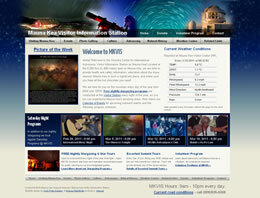 CMS Made Simple content management system coupled with Kilauea WebWorks eStore shopping cart. 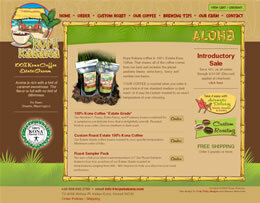 Logo design, package design and a shopping cart site for Kope Kabana 100% Kona Coffee. 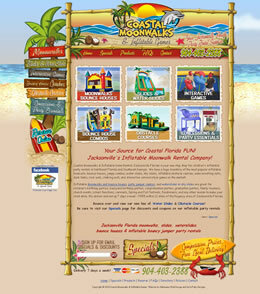 The site uses Kilauea Webworks' eStore to power the store section. 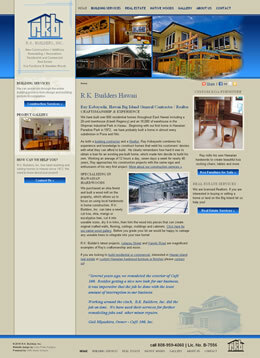 Rredesign of the Hawaii Island Bed and Breakfast Association's website. The site is built within OpenRealty, a giving each member their own login to allow them to manage their listing while securing the other listings. This project was completed as a subcontract of Kilauea Webworks. 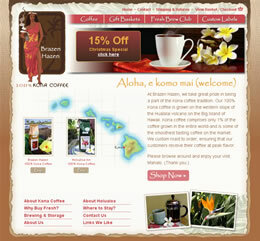 A sales site for Brazen Hazen Coffee company's 100% Kona Coffee. Features include a custom script for simple sales banners, random image rotation for the masthead. This project was completed as a subcontract of Kilauea Webworks and features their proprietary eStore shopping cart system for processing sales.